The SC Pirates professional roller hockey team prepares for their first season's playoffs. Doug Jones, SC Pirates co-captain, talks about the upcoming championship games, as well as the support the team has received its first year from the people, businesses and organizations in the community of Little River and the greater Grand Strand. Jones also mentions a few of the local area organizations and charities the team has generously helped or promoted this season. The playoffs are on Mother's Day at the Sports Zone where local singing sensation Gabbie Rae will perform, and the players will introduce their mothers to attendees during halftime. A new media conference covering blogging, podcasting, video blogging and social networking web sites had its debut on Saturday, April 19, 2008, at the historic train depot in Myrtle Beach. Featured speaker was Ed Cone, one of the principals behind the annual Converge South Conference. Lunch was prepared and coordinated by expert BBQ judge Andre Pope with entertainment by the talented Yale brothers, twins Chris and Roger, who performed original songs from Chris' debut CD, "Well Enough Alone". The Little River Chamber of Commerce recently held a successful Business After Hours at the Brentwood Restaurant in Little River. The Brentwood, built in 1910, is historically significant as the former home of Essie McCorsley, having been moved across Highway 17 to its present site on Luck Avenue. New owners Eric and Kimberlee Masson bought the historic restaurant last summer. Marcia Lynn talks with Bill Holland of the Vietnam's Veteran's Association at Choppers Sports Bar and Grill on Restaurant Row in Myrtle Beach. 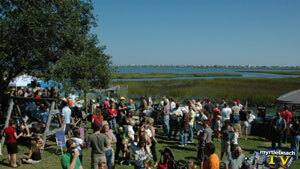 The fundraising event, also cross-promoted by local motorcycle group Rolling Thunder, featured one the most in demand and popular local rock bands, the Sick Stooges. The band started playing at 4:30pm, and was tragically cut off at 6pm for basketball to start playing on the big screens at the sports bar and grill. Note: We have updates on the Market Common, but for some reason we were removed from the press list. We did get coverage of the opening, and will unveil it soon. Just one year after breaking ground, follow the hard-hat tour of the The Market Common, the multi-million dollar, mixed-use redevelopment of the old Airforce base that's changing the face of south Myrtle Beach. Watch the Market Common Update: One Year After Ground-Breaking that appeared in episode 21 of the show. Benefitting the local chapter of the Surfrider Foundation, we ate lots of chili, and talked with lots of locals, including Cecil Chandler, who demonstrates just how hot the chili is, and with Bruxanne Hein, organizer of the event. Watch the Surfrider Chilympics at Hot Fish Club that appeared as one of the giving back segments in episode 21 of the show. 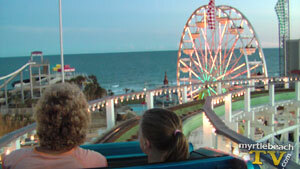 Follow myrtle beach TV around the Family Kingdom Amusement Park after a Myrtle Beach Chamber Business After Hours. We even brave the wooden rollercoaster with the digital still and JVC hi-def cameras and catch some pretty striking shots and footage of the ocean and nearby streets. Watch the Family Kingdom Fun segment that appeared in episode 20 of the show. The myrtle beach TV show takes local realilty TV to a fairly personal level with a trip to the dentist -- one that treats Marcia Lynn for her extreme anxiety. Sedation and a beautiful smile go hand in hand for Marcia, as well as a more robust dental bill, but she and others like her feel it's more than worth it for healthy teeth and gums, without the pain and anxiety normally associated with dental work. Watch the behind the scenes trip to the Myrtle Beach dentist that appeared in episode 17 of the show. In a short but touching piece aired on episode 17, myrtle beach TV documented local veterans and others who reminded the public to "Never Forget" the tragedy of September 11, 2001. 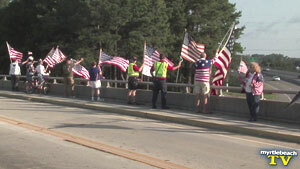 Standing on bridges, proudly displaying flags for all drivers to view, their message was hopefully clear to all. Watch the Never Forget 9/11 : Flags on Bridges that appeared in episode 17 of the show. 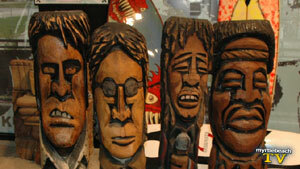 The first rock-n-roll theme park in the world is set to open in Myrtle Beach in 2008. But the Backstage Tour is open to visitors now, and myrtle beach TV caught a glimpse of the tour on a recent trip to the park. Watch the Hard Rock Park Backstage Tour that first appeared on FOX TV during episode 15 of the show. Want delicious homemade Italian food? Want to be entertained with unique, you-never-know-who'll-drop-in jazz and ragtime musicians from around the USA? Then Cozy O's in Little River is the place for you! Catch an impromptu performance from an extremely talented group of musicians that myrtle beach TV captured one night when stopping in for dinner. 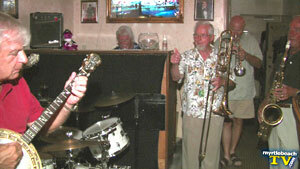 Watch the Musicians at Cozy O's segment that appeared in episode 19 of the myrtle beach TV show on FOX. In a short segment on episode 12 of the myrtle beach TV show, the redevelopment of the former airforce base -- and the progress of the new Market Common -- is captured in hi-def footage. Watch the Market Common Progress : A Quick Visual that appeared in episode 12 of the series.